The internet is full of cyber crime, no matter what you do and how safely you do it. There will be someone who can break your security and stole all your data. There are a number of hackers who can do suspicious things to your system just by gaining access to your system. It is very hard to any spammer or hacker to get into your system without taking help of you. It is very hard to any spammer or hacker to get into your system without taking help of you. Yes, you heard it right. You are the one who helps an attacker to get into your system by doing your regular things on the internet or on your computer. The only thing that makes difference is that you don’t know what you are actually up to or what you are about to do and behind the scene, the attacker gets the access into your system. This can be happened through an email or by some harmful sites that look very genuine but somehow they are trying to push their tracking programs into your system. These programs are known as keyloggers. A keylogger is very dangerous to your system. It can steal each and every data of your system by tracking the keys. Every time you do a key stroke it detects that in the background without knowing anyone. How dangerous can a Keylogger be? A keylogger can ruin you completely by stealing your bank account detail or credit card info. Every time you Login to your social account they also are getting traced. If you are a type of person who usually does shopping and visits a lot of sites then you must know how to detect a keylogger in your system. How long a keylogger takes to steal the data? On that time of entering in your system, its roots begin to solidify. So, the time in seconds and it instantly started sharing every keystroke by you. If you don’t then you are giving them info about everything that they need to know about you and for that time there is nothing that can be hidden by you. You will be completely exposed and hanged like a freeware product to use. If you smart enough to know what are the system services and what services or processes are running on your installed software then you should probably try this manual method. This is very smooth and easy to way to detect a keylogger without taking help of any other software. Firstly Open your task manager. Have a look at the processes. Check all the background processes. If you find any process that is not in related to any of your software program then it is definitely a keylogger that is running in the background of your system. You can select that process and click on end process. This is the easiest way to detect any kind of keylogger in your system. In this, All you have to do is just follow below steps and you can easily find out the keylogger in your computer or laptop. Go to this link and Download the Keylogger Detector. Open the downloaded file and Install the tool. Click the install button and complete the installation process. 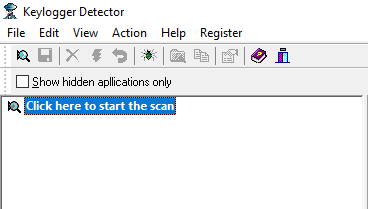 After completing the install, open the Keylogger Detector. Click on Click here to start the scan. After completing the scan you will see a list of suspicious programs if they existing on your device. You can end the process and delete that keylogger easily through this tool’s panel. This is a paid tool but you will have 14-days trial at the first time. If you think you are infected with some other malware then you can simply run a scan using Malwarebytes. It is also recommended to remove spyware and malware and very excellent to use. Tip: If ever you find out any keylogger in your system, then instantly turn off your internet connection. The keylogger can wirelessly share the data using your internet. If the Internet will be disabled then the data will come in queue and stable there until it gets the internet connection again. On that time you can remove the keylogger from your system. Hope this helps you to get rid of keyloggers. If you find out or detect any keylogger in your system then let us know in the comment below.